What Is LTU? or What does LTU stand for? Chief Commissioner Inland Revenue (Large Taxpayers Unit, Karachi/Lahore/Islamabad) LTUs were established with the objectives to provide convenience to the Large Taxpayers. * All matter relating to administrative control. * Generation of revenue with in jurisdiction. * All legal issues pertaining to the jurisdiction. * Any other assignment by the chairman. He/She is assisted by Commissioner Additional Commissioner , Deputy Commissioner, Assistant Commissioner/Taxation Officers.. 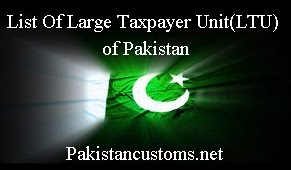 Here is List of Large Taxpayer Unit(LTU) of Islamabad, Lahore and Karachi Their Address, Phone Number and Email Address.